Chic Beauty Buzz.... The H2PRO Beauty Life Way! While we're schlepping through the snow in the hottest booties, coveted sweaters and stylish accessories our hair may be feeling a bit left out these days. With Black Friday deals and department store discounts, a fashionista can look like a million bucks without breaking the bank.... Can we say the same about our hair??? The economy has forced many fashionistas to forgo weekly salon visits in lieu of at home maintenance. Uh yeah... At Home Maintenance!! What was once considered a horrid notion in the beauty industry has taken on a new sleek and savvy meaning with fabulous results. The chic and savvy minds at H2Pro have revolutionized the way we think about hair care styling at home. 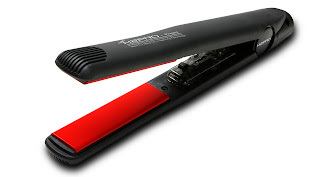 With a bevy of flat irons on the market, it's often tough deciding who trumps the market. After reviewing and testing about 20 or so in the last year, I've finally found The One! The Presto uses ceramic tourmaline with advanced Thermal Ionic and Nano Technology. The first iron to feature Turbo Power Technology with a turbo trigger to cut styling time and simultaneously seal in moisture (How haute is that??) . The iron reaches 450°F in a matter of seconds (it really does). The Bonus: Every time the iron is clamped the tool’s turbo trigger releases a shot of heat for even better styling control, while still offering consistent heat distribution. I am totally smitten with this iron for many reasons, the first being the size. It's super small and can fit in my handbag. It's great for after the gym or anytime my style needs a lil' lift. As a fsahsion stylist, mommy and entrepreneur I'm always on the go and this is perefct for those quick touch-ups. I also liked the fact that I didn't have to keep running the iron through my hair (like most irons). It's not only damaging on the hair but takes a lot of time, I normally don't have. One time and Presto... You're Done!